At Yellowstone Bear World we do not want anyone to miss the opportunity to view these spectacular animals. 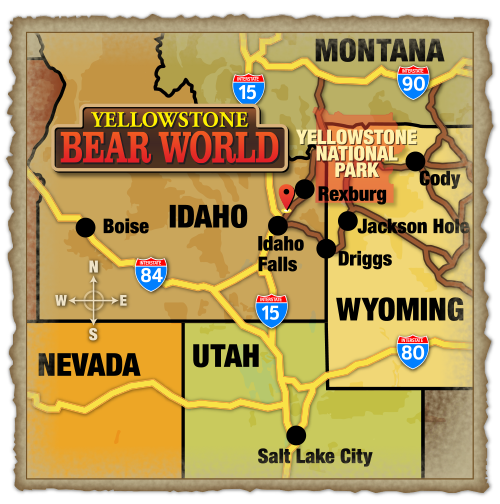 Therefore, Yellowstone Bear World accommodates all vehicles including: travel trailers, motor homes, and tour buses. We can also accommodate semi-trucks & motorcycles with the help of a furnished loaner vehicle. Admission Price includes petting zoo, amusement rides and unlimited tours through the park. For Wildlife Excursions (formerly Curator Tours) and Bottle Feedings, additional rates apply. Yellowstone Bear World offers great rates for motor coach tours.Contact Us. Yellowstone Bear World also offers group rates for groups larger than 15 people. *Maximum car load rate applies to private vehicles only. For group rates or commercial operators please Contact Us. Buy Now and Save $1.00! *Bottle-feeding experience does not include admission, must be purchased separately. You can enjoy the excitement of Yellowstone Bear World all season long! Your child can enjoy the excitement of Yellowstone Bear World all season long! Buy Now and Save $10.00! You and any 6 other people can enjoy the excitement of Yellowstone Bear World all season long!